After the pilot episode, I have to admit that The Human Condition caught my interest; an interesting blend of variety and documentary, which brings about awareness about the the topic at hand at the same time. So I went on to watch the episodes that followed. 6 different personalities and 6 different outlooks on money. How will they survive a week without money? The first episode starts off with the members being clueless about what the mission for the week would be. They are all invited to a famous ginseng chicken restaurant for breakfast (basically a good meal). The reaction from the members vary (as they are hilarious) as they try to guess what the mission could be. 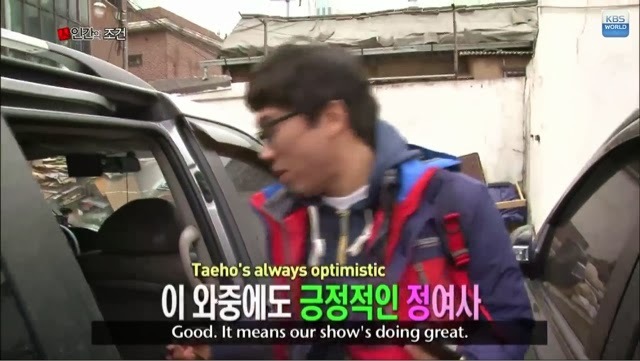 Taeho is the only optimistic one believing that they are getting a treat because the show is doing while. The rest on the other hand, are optimistic and have the worst (they can think of) in their minds. They enter the restaurant and try to put aside their apprehension. As soon as the food arrives, their worries dissipate and they enjoy the hearty meal (while complaining who had lesser airtime for the pilot episode and joking around). But as soon as the meal ends, they are already discussing who should pay, which falls on Sungho. Sungho is relieved to hear that their meal is already paid for. They ask what the mission for the week is, but the production team keeps the suspense and tells them that all will be revealed when they arrive at the house. Immediately the members imagination goes into overdrive as they try to guess what could be the reason that the production team refused to tell them immediately and were acting kind of suspicious. But all of them had a feeling that this was going to be a very difficult and hard mission (considering that they were so well fed). The moment the members arrive at the house, they start to speculate what the mission could be and the mission of the week is living without... MONEY! They are stunned and in a daze they moment they hear it. Just the thought of living without money already brings shudders. So the mission for this episode is to try to live without money - the one thing that we determine the value of things, which can also be a condition to happiness ... or is it? To find genuine happiness they have to live without money for a week. 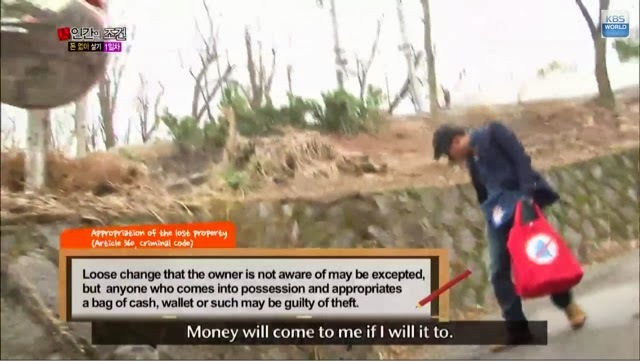 The rules are set: they have to earn their own money for their living expenses for the week and they cannot use their gagmen status to earn the money. With reluctance, they hand over their wallets but not before Junhyeon realizes that he has to pay for a new television he ordered for his up-and-coming wedding. With quick thinking he sends the money over to his wife-to-be and reluctantly hands over his wallet like the rest of them. Left whatever amount of money they have in their wallet, they have to find out how to earn and survive with it. 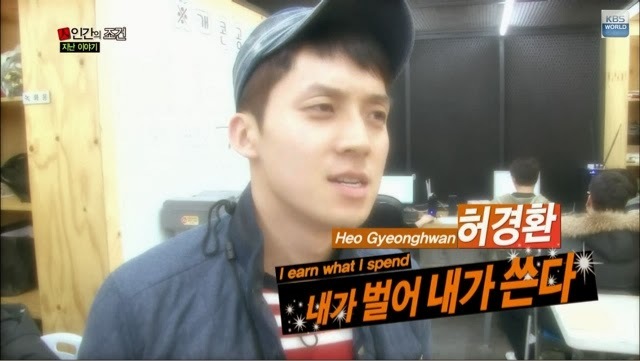 Suddenly Gyeonghwan gets worried as he has an event at Busan and does not have enough money to get back to Seoul. 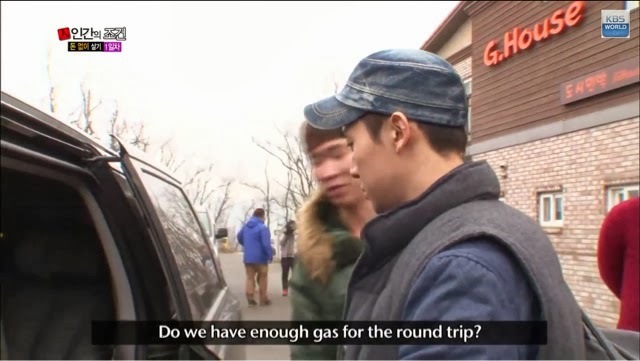 Taeho assures him that he will try to figure out a way to help him. Having said that, the member set off for the day (with the worry about money at the top of their minds). 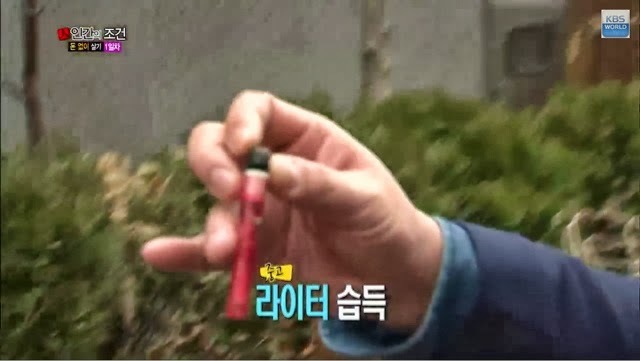 Junho is the first to set off, literally looking for money on the ground around the estate and he finds a.. lighter instead (which is broken). Still he does not find any money after all that walking. 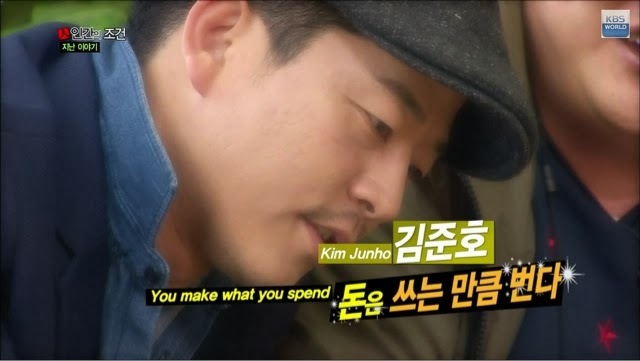 Sungho, after having given up on 'finding' money has a brainstorm idea. He will trade his way up from a flashlight that he has (inspiration from Kyle Macdonlad). Armed withis his flashligh he looks for a potential barter and he succeeds working his way up. From running errands to part-time jobs (even using a metal detector to fund coins at the playground! 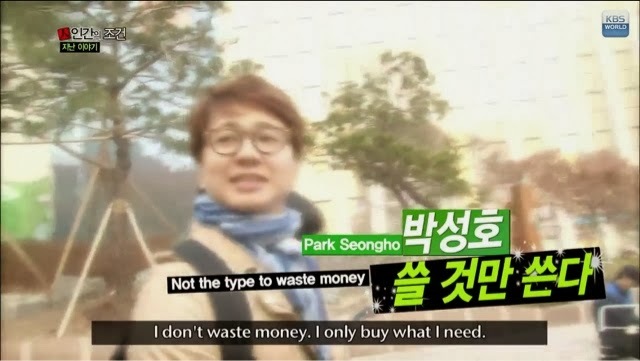 ), the members try their best to earn money that they need and come to a realization - it is not the amount of money that makes you happy but being content with what you have that makes you happy, instead of endlessly trying to earn alot but never getting a chance to enjoy the money earned or just wasting it on the things that are not important.